Return to general Mormon history article. Return to previous time period. Utah was largely removed from the horrors of the U.S. Civil War (1861-1865). The Mormons continued to settle large swaths of the American West and to establish beautiful cities, such as Salt Lake City. The Salt Lake Temple was begun in 1853, the famous Tabernacle was built, and the Mormon Tabernacle Choir, named for its justly famous venue, was instituted by Welsh immigrants. The Church was reorganized following the rigors of the exodus from Nauvoo. The Relief Society was reinvigorated and Eliza R. Snow, famous for her poetry, became the President. The Relief Society published magazines. They campaigned for women’s rights and established the first hospitals in Utah. However, once the Civil War was concluded and slavery was ended, the federal government turned its eye back to Utah to end the other ‘relic of barbarism,’ polygamy, or plural marriage. Mormons often referred to polygamy as "The Principle." In 1862, the Morrill anti-bigamy bill was passed, which made it illegal to have more than one wife. Bigamy was difficult to prove, so very few were ever prosecuted under this law. Brigham Young was arrested, but eventually released without trial. Utah’s isolation and independence made it difficult to vigorously prosecute the Mormon polygamists. Throughout the rest of Brigham Young’s life, only token efforts were made to attack polygamy. Instead, Utah and the Church moved forward. Brigham Young oversaw the construction of Utah temples in St. George, Logan, and Manti. In 1869, the Church established the first incorporated department store in the world, Zion's Co-operative Mercantile Institution, commonly called ZCMI. In 1870, Utah became the first state to give women the right to vote, although Wyoming conferred the right later that year and held their elections before Utah; thus Wyoming became the first state where women actually voted. Anti-Mormon forces hoped the women would vote contrary to the men of the Church, but this was not the case. Toward the end of his life, Brigham Young organized a society for young ladies, called the Retrenchment Society, and re-organized the quorums and bodies of the Priesthood to be more efficient and more in harmony with the revelations given to the Prophet Joseph Smith. On August 29, 1877, Brigham Young died while visiting the city of St. George in southern Utah. Saddened though they were by the death of this great leader, Mormons moved on and Mormonism continued to grow, since no one man Jesus Christ was central to its mission and teachings. The Quorum of the Twelve Apostles led the Church until John Taylor, a British convert, became the third president in 1880. That year the Church celebrated its Jubilee by forgiving debts and holding numerous parties. They also accepted the Pearl of Great Price as one of the standard works, or scriptural canon, of Mormonism. Persecution from the government only increased as the Church continued to grow. In 1882, the Edmunds Act, which outlawed cohabitation with more than one woman, was passed. To enforce this, U.S. President Chester A. Arthur sent the Utah Commission. All Mormons who practiced polygamy were disenfranchised, stripped of the right to vote or hold public office. They were also jailed. Although this clearly violated U.S. constitutional law forbidding ex post facto laws, over 1,300 men were jailed. In Idaho, a loyalty oath was instituted in 1885, which required all residents to swear they opposed polygamy or any organization that taught it, in order to vote. This effectively disenfranchised all Mormons. Mormons appealed these laws all the way to the Supreme Court of the United States, but things only got worse. In 1887, the U.S. Congress passed the Edmunds-Tucker Act which disincorporated the Church and seized virtually all of its property. It required loyalty oaths from local officials, which kept even Mormons not practicing polygamy from holding office, and allowed the federal government to appoint state officers and even control what textbooks could be allowed in classrooms. Many thousands of Mormons languished in prisons. Federal appointees, many unfriendly to the Mormons, were appointed as judges and magistrates in the territory. Mormon leaders fled into hiding. Thousands of Mormons fled to Canada and Mexico at this time, where their descendants still live today, though some Mormons fled Mexico for the United States during the war with Poncho Villa in the early twentieth century. In July 1887, John Taylor died while in hiding. His funeral was small, since sheriffs awaited to arrest any Mormon leaders who came. 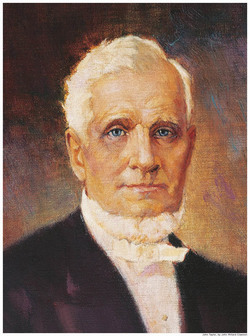 Some two years later, Wilford Woodruff, an early convert to Mormonism from Ohio, became President of the Church. He began his ministry in hiding. After much prayer and discussion with the other Apostles, President Woodruff received a revelation from God in 1890. It showed him what would happen if the Mormon Church continued to practice polygamy. All the temples and churches would be lost. All their men would languish in jail and no missionaries could be sent out. He prayed fervently to know God’s will and was shown that the wisest course would be to cease practicing polygamy. He realized that temple work and missionary work were much more important. He also remembered that the Lord had said he sometimes commands His children to practice polygamy and sometimes forbids it. In October, 1890, the Church accepted this revelation as the will of God. The practice of polygamy ceased. The end of persecution allowed other work to go forward. In 1893, the Salt Lake Temple was finished and dedicated, forty years to date after it was officially begun. The Mormon Tabernacle Choir did its first concert outside of Utah at the Chicago World Fair. Missionaries first reached parts of the South Pacific and Asia. By 1901, they would be preaching in Japan. In 1894, Wilford Woodruff received another revelation showing that children were to be sealed, or bound by the power of the Priesthood to their parents, in the temple. Also in that year, President Grover Cleveland, who had long be friendly to the Mormons and had opposed the Edmunds-Tucker Act, pardoned all polygamists. In 1896, Utah was admitted into the union as the forty-fifth state. In September, 1898, Wilford Woodruff died while visiting Mormon congregations in California. Proceed to next time period. This page was last edited on 30 August 2011, at 09:44.